Thursday June 14th 1894 I put up gooseberries this morning and Leonard picked part of the cherries. I sewed some in the afternoon but did not feel at all like work The weather is very hot the boys are making hay. Friday June 15th 1894 Leonard picked the rest of the cherries this morning and I put them all up I did not finish till after dinner. I sewed some after that I feel better than I did yesterday. Uncle Jim Stevens was here a little while. It looked very much like rain in the evening. Saturday June 16th 1894 I was busy with sweeping and baking most of the forenoon. It did not rain much last night and was very hot again today. Mother & Mrs Bremmer were out a little while. We went in town in the afternoon. It was late when we got in I did not go over the river but went down to Mrs Barlines a little while. Sunday June 17th 1894 It was raining this morning. Leonard did not come home last night. Will and I were both busy about the place most of the forenoon We read in the afternoon. John Hatt & Edith were here for supper After they had gone we did the evening work. 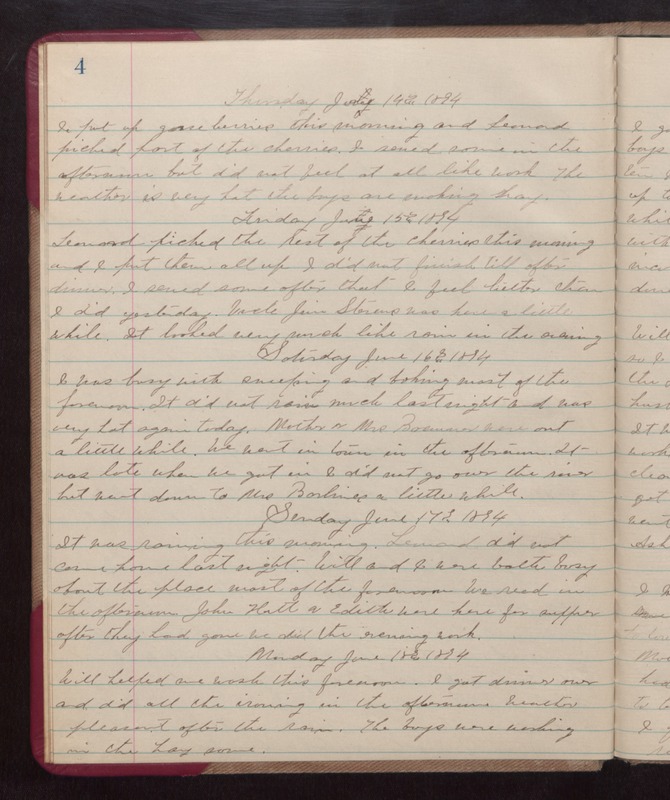 Monday June 18th 1894 Will helped me wash this forenoon. I got dinner out and did all the ironing in the afternoon Weather pleasant after the rain. The boys were working in the hay some.